Assist. 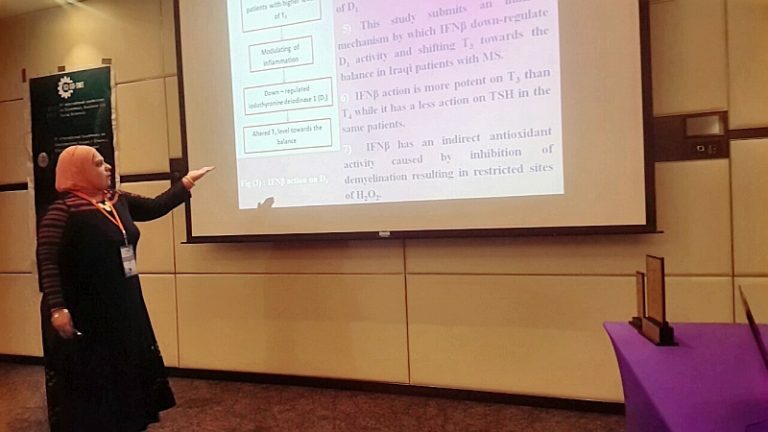 Prof. Rasha Zuhair Jassim from the department of chemistry at the college of education for pure sciences (Ibn al-Haitham) participated in the 16th international conference of applied science and engineering (ICCI-SEM-2019) held in UAE with a research paper entitled (Multiple sclerosis is a risk factor for hyperthyroidism and interferon beta action on thyroid hormones via novel immuno neuro enzymological mechanisms) which scored the first rank among 9 countries that participated in this conference. The researcher addressed numerous innovations about the hardening of the nerves that could be a risk factor for excessive secretion of thyroid hormones and found that the treatment can be more effective with the use of Ttriiodothyronine hormone is more effective when compared with Thyroxine hormone since it possesses antioxidant properties. It is noteworthy that this research has contributed to give a clear vision of the high level of the NF-kappa B complex protein associated with the nervous system and which is the major component of the immune system.